Does the world need another website and more content? That is the question uppermost in my mind as I rediscover Zite after a Christmas party conversation reminded me about this powerful, useful and fun app. Zite is a “news reading app” or, more precisely, a content aggregator app. 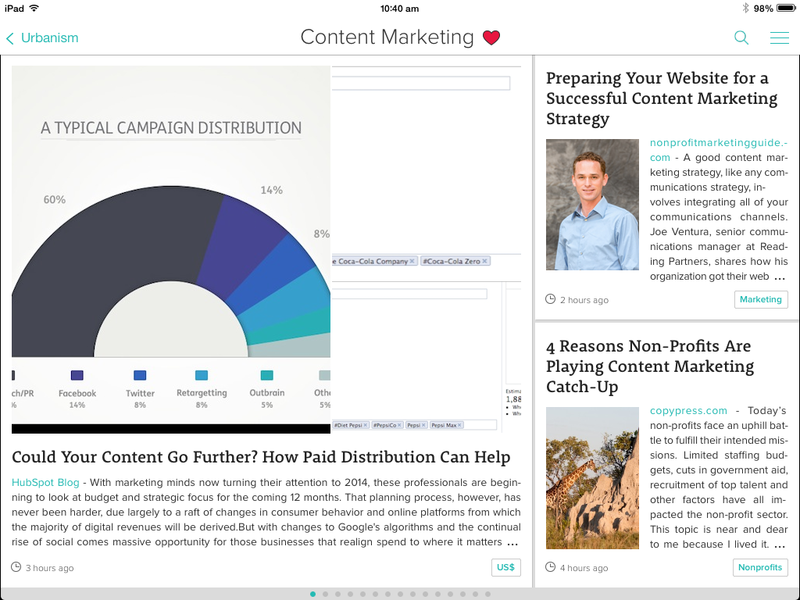 Zite doesn’t create any content – it finds content and brings stories to you, the reader. Tell Zite what you are interested in, and Zite finds it. There’s heaps of these types of apps (here are the top 10 according to Simply Zesty). But I must say, Zite is cool. So where does that leave a content creator like me, and the many companies that are adopting content marketing as a way to build relationships with clients and prospective clients? Here are some of the essential lessons from the aggregators to take into account when we create content. Aggregator apps raise the bar for the standard of content pretty damn quick. Looking at the stories on Zite drives home the point that every story you write or publish can and will be compared against the best in the world. If you are producing a lot of content but the quality isn’t high, it’s time for a rethink. Well-researched, timely and relevant stories stand out like the proverbial on aggregator sites. Brands become publishers when they adopt content marketing, as King Content’s Cameron Upshall succinctly put it in a recent article on this site. But aggregators drive home the point that there are already many thriving publications on every possible subject. Guest blogging is an essential part of every content marketer’s campaign, and will make it easier to ensure that the stories that you publish on your own site could not be published elsewhere. Of course, you might need to establish your cred by publishing on your own site for a while before others will accept your work. I use these aggregator sites for research. How wonderfully simple it is to find new and interesting ideas, facts, data and experts. Using these sites means that you are sure you are not rehashing a subject already handled by many others across the globe. Or, if you are, you are doing a much better job of it. Stories stimulate ideas that you can pursue in your own work. And aggregators also reveal just where the content gaps are that you can fill with excellent new ideas. So download a few aggregator apps and use them to take your content marketing campaign to new heights.